Over the course of 37 issues, Joe Hill and Gabriel Rodríguez’s Locke & Key told a story abounding with strange transformations, unearthly horrors and the bonds of family. The saga of Keyhouse Manor and its titular keys is one of the best-plotted tales in recent comics history, and the details help make it even more memorable—especially how Rodriguez’s ability to render body language heightens the plot at certain crucial moments. 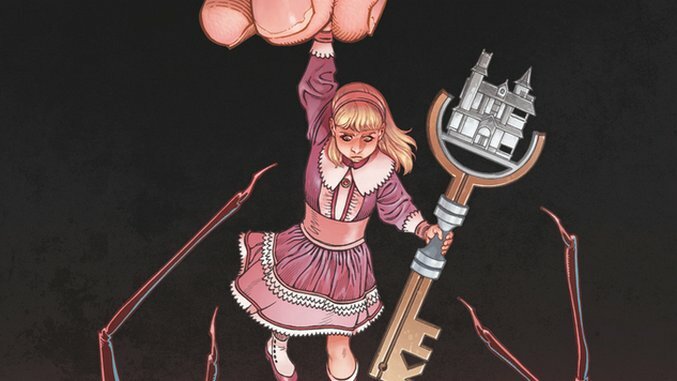 Locke & Key focuses on one generation of the Locke family confronting the repercussions of a terrible mistake made by the previous, but the narrative offers glimpses of several centuries’ worth of potential stories. The “Golden Age” stories, set around the turn of the last century, serve as one example. Small World, Hill and Rodríguez’s return to the series which released this week, is one such flashback, and focuses on a new key, a dollhouse and the way that proportions can be used to grand effect in stories of the supernatural. In advance of the one-shot, Paste e-mailed with Rodríguez about the making of Small World and the evolution of his working process with Hill over the years. Paste: Proportions and perspective play such a significant role here—did that create any unique illustration challenges for you? Gabriel Rodríguez: Playing with perspective and scale has always been interesting to me, as I think they are tools that really help drive the narrative of the story in terms of dramatic tone and time perception. Certainly my architectural background has played a role in this, but I really put my efforts into turning them into an honest and effective narrative language over descriptive representation. In stories told from the point of view of children, I think it’s especially crucial, as I think as kids we have a perception of our environment that certainly creates a larger (both in size and possibilities) perception of the world around us, and if I attempted to capture some of that in this story (up to the readers to tell), that, I think, accomplished an important part of the challenge. But beyond the issues of perspective, proportions or scale, the true challenge in Small World was to drive the entire action of the issue inside Keyhouse (and the Keyhouse inside Keyhouse), as it is both the main character in the overarching Locke & Key mythology, and the most painstakingly designed element to draw in it, too. Paste: Much of the tension of this story comes from the way in which the Small World Key interacts with the dollhouse located within Keyhouse. This seems to be one of the more complex keys we’ve seen yet, in terms of its ability. What was the process like as far as coming up with its specific properties and its place in the collection? Rodríguez: It has a very special role as this issue will be the gateway to the collected one-shots collection (more on that later) that will complete a series started with Open The Moon and Grindhouse. The Small World Key and its magic abilities don’t feel as hard to bring to life once you’ve done things as insane as the Head Key, and also came up naturally as Joe had a very specific idea of the kind of story he wanted to tell with this episode. When he first mentioned it, I think we both sort of discussed the tone and visual possibilities that idea had, and then he came up in one blow with another perfectly engaging, funny and vividly scripted Locke & Key tale. He had such a clean vision on how to set up the basic dilemma, the characters and the crisis that they would face, that the only real challenge and painful part of the process was the intense effort to be able to get to that same creative level with proper visuals to flesh out the story. Paste: Over time, you’ve illustrated several characters wearing the Crown of Shadows. As the artist, how do vary the beings created with it depending on the user? Rodríguez: As I came to understand the magic of the Crown of Shadows, it becomes a sort of filter that reveals something intimate not about the one who’s wearing it only, but about everyone who stands around its influential scope. So it keeps revealing new shadows that tell something about the ones that cast them, and then turned them into inhabitants of Keyhouse ready to return somewhere in time when needed. That’s why sometimes you find out that people may cast similar shadows, or even eventually cast the same one somebody else cast ages ago… But they all become a part of the army the crown rules, and independent of who cast them out, they will obey the will of their crowned master without even flinching once. Paste: When telling a story that’s confined to one issue, are there any challenges for you as far as making the storytelling more concise? Rodríguez: You’ve got to squeeze every single panel up until it brings out every ink drop of potential for world building, and for characterization. Even if there’s a character that appears only in a couple panels, you’ve got to be able to convey body language, mood, attitude, age, psychological depth, back-story… as much as you can. You probably won’t be able to get it every time, but that’s what you must aim for. Making comics is, above all, about restrictions of space to tell impossibly big stories. You have to be very responsible about what you do and what is left undone. Paste: You’ve been collaborating with Joe Hill for nearly a decade now. Did your working process change at all for this book, especially after a break between Locke & Key outings? Rodríguez: It has, if anything, gotten better, more natural and more enriching. We know what we want to tell, what we care about, and how we want to tell things. And despite that, every creative process brings out surprises for both of us. So working in this book felt like returning back home, only to discover that home was bigger, brighter (or darker, maybe) and filled with more surprises. Paste: This issue is dedicated to John Bellairs and Edward Gorey. Were there any specific works of theirs that you drew inspiration from for this story? Rodríguez: Those dedications were chosen by Joe, so I can’t answer this for him. But I can tell that in this book I was very influenced by the work of Wally Wood and Jean Giraud [Moebius], especially in his work on Blueberry. Paste: There have now been several “Golden Age” Locke & Key stories. What do you find most interesting about illustrating a story set over a century in the past, away from the core cast? Do you have other eras you’d particularly like to tackle? Rodríguez: We love doing stories for the Golden Age series of one-shots (that we hope to complete soon in order to collect a 7th Locke & Key book) mostly because we love Chamberlin Locke and his family—despite the age setting, because it lets us explore further into the Locke’s mythology and the magic keys’ possibilities. We have discussed with Joe several time the chance to explore a couple more eras through the eyes of other members of past generations of the Lockes, but we don’t want to spoil that yet. Hope it’ll be a nice surprise if we manage to make it happen.